New Raffle! Free Images & Lots More! Lotsa stuff to cover, and not alot of time.. so I’m gonna try to keep it brief! ART & COLLAGE SUPPLIES GIVEAWAY/RAFFLE! It’s not my best work, I don’t feel good enough about it to sell it, but I can’t bring myself to work over it either… so it’s become the latest piece I’ll give a away! 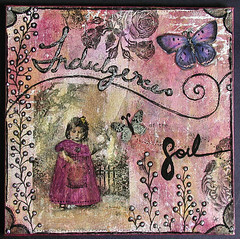 Want to win this piece, in addition to a free, large collage kit? Simply leave a comment on this entry, by January 4th 2007 .. and you’ll be entered to win .. it’s that simple! I may decide to give away additional lil supply kits too should the turn out be big enough! International Folks are more then welcome to play too! Winner will be drawn on January 5th 2007. Winners from the last contest, I finally got your kits out! Keep your eyes on the mail! 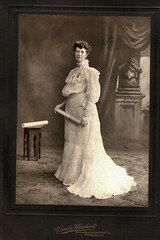 I uploaded 30 or so new vintage images for y’all to download, and use in your art.. Happy Holidays! Remember, my Collage Images group has over 4,000 free images for you to get, and share! From Wednesday, 12/27 through Wednesday 1/3 .. please be patient as I won’t have access to email etc daily. Finally a holiday I won’t spend alone this year! Yippee! Offers between my stores, can’t be combined, Sorry! 7 Free Collage Sheets or 15 Yards of luxurious fibers — Your Choice! Purchase $30.00 worth of merchandise and receive...15 Free Collage Sheets or 30 Yards of Luxurious Fibers – Your Choice! 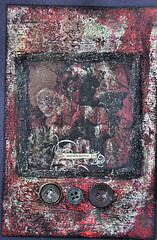 Purchase any of my artwork available, and I’ll custom create an original ACEO just for you when I return! Valid On Artwork bought, and paid for Through January 2nd, 2007. 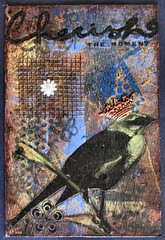 ACEO will be shipped separately, with 6 weeks from purchase date. 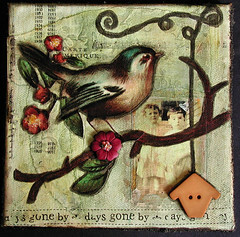 Tell me you want the Blog ACEO deal to get it! Here’s the newest pieces added that haven’t sold (others are on there as well) to see all my new works, check out my flickr page. And the free matching avatar deal I told you about yesterday is still valid on any of the ETSY banners you purchase! Whew — this entry took a lil over 2.5 hours to do… ikes! Have a fantastic New Year everybody! Amazing-I never get tired of checking out this blog. I am taking a break from writing out my donations for the year and here you are giving away some goodies too! Have a wonderful 2007! Have a great holiday! Love the featured work. Nice work, Chrysti … an inspiration as always! Happy New Year! This work is wonderful, as always! Have a safe trip, and Happy New Year. Beautiful work! I’m glad that I finally stopped over – enjoy your holiday! Very inspirational work! Love your blog! Your work always amazes me. I think this piece is beautiful! What a wonderful visual feast! PS Thank you–I just got my order from Covet Me and the heavyweight pineapple paper is luscious! I’ll definately be ordering more! YAY! I love your stuff, there is always something here to inspire me! I’ve already used what I purchased from you to brighten up my fairies! Thanks for offering such wonderful stuff! Have a wonderful holiday and enjoy your time off! Your site is amazing and I love what you write. Keep it coming!! Really love this one. I think it is perfekt. Happy holidays and a very happy and creative 2007 for you. I think this is a real nice piece. Why don’t you like it? Well we are our harshest critic sometimes. Hoping I’m lucky enough that you draw my name. Wow….you’ve been a busy person!! I’m gonna be gone the same amount of time as you!! I hope you enjoy your trip!! I know I will as I’ll get to see my best friend, my family and many other friends too!! And I think your prize for your latest contest is GREAT!! Artists are always their own worst critic!! Boy, you can say that again, Krissy (artists are their own worst critics!) I think this piece is splendid! But what a great way of recycling art, Chrysti, shows true artisanship! Have a wonderful time on your trip, see you when you get back! Happy New Year! Another great piece of art! I have just the place in my home for it to grace if I’m lucky enough to win it! Beautiful work on etsy too…I’m headed there now to see all your amazing art! Have a wonderful tip and holiday! What a fun idea. I’ve enjoyed perusing your blog. Have a great trip! Oh, another bird composition…love it! Thanks for your generosity. 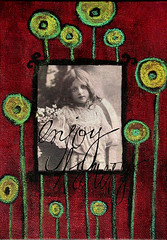 I love – love – love “Enjoy Beauty!” Your collage would occupy a special place in my Art Room. I like the dreamy look of the collage. Your work is beautiful! Thank you for directing me here from the Collage with Claudine group! Best Wishes for 2007. Oh, yeah..thanks for the collage images. Love the colors, almost makes me think of eyes, like beauty is in the eye of the beholder. Haven’t visited in a very long time, need to look some more. Chrysti I just love your art and your blog. I enjoyed the flickr too. Thank you for the images. What a beautiful bird! And “Enjoy Beauty” is gorgeous! As others have said…. we are always our own worst critic. Your work is always inspirational to me….and this is no exception. Happy New Year… and safe travels! Wow, Chrysti, you continue to inspire me! Your work is wonderful, and your spirit of generosity never ceases to amaze me! I hope you had a wonderful holiday, and I wish you all the best in the new year! Happy New Year, Chrysti — Enjoy your time away!!!! :) I love your art — all of it!!! Chrysti – your work is mind-bogglingly gorgeous … and so inspirational. Honestly, I could stare at it all day. Have a great New Year … I wish you much joy and happiness in 2007! Love your blog! You are an inspiration. Have a great trip! Wow, I love your blog! Have a great vacation! Your Enjoy Beauty collage is just perfect as it is!! Honestly! But I hear you. Sometimes our creations just don’t bring us that deep feeling of satisfaction, no matter how much praise we receive from others. Have a lovely time away, and thanks again for customizing that banner for me yesterday. Superb service! Enjoy Beauty is beautiful. I am always inspired after a visit to this blog! I am off to check out your etsy listings! Really love your work. I’m new to collage and all that and can only aspire to your standards. Beautiful backgrounds and love the animal themes. Love the art you posted! Your art is always so unbelievably inspiring! Good luck wih the surgery! You make beatiful things, Chrysti! Your blog is full of such wonderful pieces. I’m headed over to see the vintage images now. THANKS & Happy New Year!!! I love looking at your work. It is such an inspiration to me. My imagination is piqued just looking at all the beautiful things. I’ve only been doing collage for about a year and I think I’m hooked! Chrysti, thanks for letting me know I posted on the wrong page! I repeat what everyone said………..you are so generous, have more creativity in your little finger than most of us have in our entire beings, very productive and deserve a little vacation! Praying for good health and every blessing in 2007. I love this piece. What did you use to paint the flowers? They have so much shimmer to them. i just noticed you’re in raleigh durham! we are looking at a school in asheville for one of our kids and my bil/sil are in durham (bahama) so i may be getting up there a lot more. it owuld be fun to have an art get together! Great work! I’m a big fan! PS – I love my new banner. Thanks! Your work is beautiful. Hope you’re having a great holiday. Oh I hope I win! Happy New Year Chrysti! Count me in for the drawing! I love your work! I love your piece! The colors you choose go together so well…I wouldn’t have thought of that color combo. Thanks so much for sharing your art. I hope you have a enjoyable and relaxing trip! Happy New Year to you and many blessings!!! Happy New Year to you and yours and have a safe and enjoyable trip! You rock the art world, baby, this piece is no exception.Happy New year; may it be a ridiculously good one! I love your work, it is very unique. I love your work with all the little details you put into them and the bold colors you use..awesome. Thank you for posting it for all to look at! Best or not it is still Beautiful! Your work is always beautiful and inspiring. We are our own worst critics aren’t we. Trust me. This is very beautiful! I’m always inspired by your work. You’re amazingly talented and gifted. I think it’s wonderful that you are sharing that gift for others to see and experience. And it’s always fun finding artists in the Raleigh/Durham area!! I love this piece. You have inspired me to set aside my mountain of work and do some real art today. Awesome work. thanks for the Give Away! Wow…that’s beautiful! I don’t know why you don’t think it’s good enough. I love the black & white contrast and the wonderful splash of color. I’d be honored to have this piece! Thank you so much for the eye candy you consistently provide! I love Enjoy Beauty. For some reason I have been enthralled with lime green tones lately (a colour that before I would never have even looked at, much less coveted). This is one of my favourite blogs! I use a reminder system from blogarithm to tell me when my blogs are updated and I am always delighted when I find a note about yours Chrysti! Great work as usual. I like it! I’ve been thinking this thought lately, “Be mindful of beauty.” I’m trying to stop and be more aware of all that is beautiful around me. Your work always inspires. Who wouldn’t love to have such a lovely collage as this one? It’s beautiful. I am so glad to have found your blog and have a chance to see your lovely art. Love your art it’s really gorgious you said it’s not good enough but I would love to get my art just a littlebit good as this one!!!! greetings and happy holidays from Holland. It’s lovely Chrysti & I’d be honored to have it ;-) Happy new year to you & may 2007 be full of days that you feel well & time to create that gorgeous art that we all love so much. You’re a regular source of inspiration to so many of us. thanks Chrysti for the chance to win one of your beautiful art pieces. You may not be satisfied, but who knows what art speaks to someone else? It’s all a mystery. Well, I think it is a charming little piece. Count me in on the drawing. Have a great trip away. I love the picture “enjoy beauty” as well as your other work. I have not had the nerve to do anything larger than a 4 x 6 art card. I have never used a canvas. Your work is inspirational. Have a fun trip. I love your stuff…. there’s not a bad one in the lot, so I’m crossing my fingers that my name gets pulled from the hat! I love your site Chrystie. You are so inspiring. Thanks for all of your generosity and sharing of all your images. They are so fun to play with. Thank you so much,Chrysti,for sharing so much of yourself with us.Your art is truly an inspiration and it gives me encouragement to express myself! I love your beautiful artwork! Enjoy your holiday and Happy New Year. You’re work is so inspirational. It always gets my creative juices flowing. And I love the piece of art that you didn’t think was good enough (it is!). Also seems like you’ve got a roaring contest here! Chrysti, I wish I could say that piece was not my best work. I would love to have it as inspiration. And, getting the free stuff wouldn’t hurt either (lol). Not sure why you think it’s not good enough to sell! You do amazing work, don’t second guess yourself!! This is amazing! Wonderful job!!! Hope you have a great New Year’s. Not good enough to sell? Are you crackers? lol…I think it is beautiful, just like the rest of your work. I had a treasury list on Etsy the past two days, ended this morning, and had your “The Rare Song” in it, and it got about 20 clicks! Yeah! Gosh! this piece is so beautiful in its simplicity! A shame not to sell it but boy do I hope I win it! Have a wonderful and inspiring New Years! I’m so glad I found your blog, your work is amazing! I’m not a new stamper but I’m new at reading blogs – and so glad to have found yours. Your “Enjoy Beauty” piece is lovely – I would love to enjoy it. Your creativity is amazing and I will be looking at your site often. Woul love to have this wonderful piece. Please put me in your raffle. Hey Chrysti…you know I love all of your artwork :o) It is always inspiring and breath taking. Glad to hear that you won’t be alone for the holidays. Happy New Year…wishing you lots of love and happiness and of course tons of creativeness throughout the year. Wow Chrysti, look at the turnout for this raffle! Count me in, “Enjoy Beauty” is lovely. Chrysti! What beautiful work you do! I’ve been admiring your stuff on the Collage Images Flickr group and eBay for some time now. You really have a lovely style all your own. And a very generous spirit! Happy New Year! Beautiful work. I’d love to own it. I think it is lovely and would be honored to have your work in my art room. What’s not to love?…I think it’s great! I was struck by the beauty of the colors. Perhaps it is too easy for one to be self critical…..I mean you could nit pick, really, any piece of art endlessly, at the end of it all, if there is one thing about it that you love – well then it is art and that is the ultimate….good or not – it’s still art….in this case I found the contrasting colors stunning! This is my first time visiting your site BTW. Wow, I’ve got lots to check out. Oooo Chrysti, love the free give-aways. Hope your holidays are great and thanks for the vintage images. I’m a quiet admirer, but all your pieces are lovely to me! Enjoy your time away. I’d love for her to come live with me. I have a beautiful garden she can look at. Very inspirational blog, i am just starting to do one myself, love your work and thankyou so much for the images they will come in very handy. Giggle…you sure know how to get people to comment on your blog! Giggle! YES YES YES…throw my name in the mix for the art! : ) How could I ever pass up a beautiful piece of yours!? Hope your Holidays have been filled with laughter and lots of fun! Hugs! Chrysti, so glad to have found your site. very nice piece of work even if you are not satisfied with it. You have a wonderful art “eye” and I like your art. May the New Year bring you success, health and unexpected blessings. You are an inspiration. The work is amazing – I love it! Enjoy your vacation and have a wonderful, creative New Year! Love your work. You rock girl. chrysti, you are always such an inspiration. i love this piece of art. i love the image choice and color choices. but i haven’t seen anything you’ve done that i haven’t fallen in love with! i look forward to seeing what you come up with in the new year. I would LOVE to add her to my growing collection of “Chrysti’s”. Also….many thx for adding your name to my etsy favorites!! Such a humbling honor indeed…. Enter me in that raffle! And my Ebay order did arrive! Sorry if you worried, even for a few minutes! It was in a bag of mail in my mom’s house next door! Wonderful inspirational art you make! I love it! happy new year! WOW WOW WOW….How cool is this….I’d sure would be blessed and honored to win…..love your art! Amazing. Am egarly awaiting your post on backgrounds. Happy New Year! Just love everything. I was thinking of you just a bit earlier as I was making something and added some of the lace paper I bought from you. Fun! Have a wonderful time over the holiday. Happy New Year. Thank you Chryst for sharing your art with us.You have given me an abundance of inspiration. Hi! I just discovered your work on Etsy. I love it! Maybe I’ll get lucky and win a little piece! I hope you don’t mind I have added your blog url to my blog… please do the same with mine if you’d like. Wow, what an awsome artwork I explored on your site. I keep my fingers crossed because I really want to win this piece. And thanks for sharing all these vintage pictures!! Chrysti, You are one of the most generous people I know. I would LOVE to own that piece of art. It looks wonderful to me. As always more new beautiful work. Enjoy your holidays, Happy New Year too! Hee! Even art you’re not happy with is manna for me. Chrysti, This little art is lovely. Please enter me. Actually, yours is probably my very favorite blog. I visit it regularly. 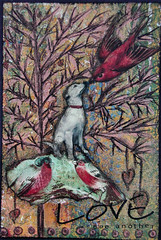 I especially love your pup related art because dogs move me so and touch my soul. Obviously, they touch yours too. good wishes for this new year. I just happened upon your site and glad I did. Your work is an inspiration! I never get tired of looking at your art. You are a true inspiration. I wish I could afford to buy it all! Happy new Year! for directing me to the right place…. this is it, isn’t it?….. LOL…. I’m drawn to collage work and mixed media art … I love seeing what talented artists like yourself are doing and I wish I didn’t live in a “one-postcard-town” so far removed from learning venues. I wish you a happy new year – and if you want a good home for your “Enjoy Beauty” art piece, please consider mine. 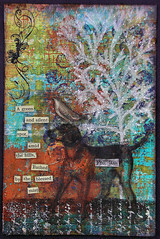 I just found your blog through the art e-zine group. Your work is really beautiful! Such an inspiration, keep it up! Chrysti – pick me…pick me….pick me!!!! Your creativity is fabulous – I want to be like you when I grow up but unfortunately…I’m past grown!!! Keep up the fantastic work and I’ll visit often. Happy New Year – may your juices never stop flowing!! I just hope in 2007 I can be as good as your self-proclaimed “not so” good art. Just fabulous…I love your style, the birds and the flow of your flowers and colors. You’ve inspired me to create something in these colors. wonderfully inspiring pieces – just lovely! have also seen your work through Artwords, thanx as always for the visual treat, here’s to a creative & magical 2007! Still love my little collection of your artworks! Looking forward to seeing what you do in 2007. Happy New Year! Would love the chance to have your art hanging in my studio. I totally understand about life happening. Hope your week gets better. Much love and peace ~ AJ who also hopes her week gets better……I lost one of my beloved friends BOGEY a couple of nights ago and can relate to the headache thing. Chrysti, I think it’s a wonderful piece. I haven’t had a chance to get back here in ages…why does Life seem so complicated right now? I’ll spend the rest of the night checking out your wonderful blog/site/work! Happy (and Healthy!) New Year to you. Your artwork is really beautiful – very inspiring to me, a collage beginner!! graceously!!! those are very amazing work of art! Your work is beautiful! I am just starting to create altered art pieces, and I love it, but it doesn’t compare to your talent! Absolutely wonderful to look at. I’m delighted with the excellence of the information of this web page. It has the advice that I have been completely searching for so very long. Very interesting indeed.